Around 33% of global consumers consider flexible packaging to be most contemporary, with the demand for standup pouches already peaking. With brands fighting for eyeballs in an already overcrowded retail shelf, the startlingly appealing packaging that is more innovative and differentiated than ever will crack the jigsaw puzzle and capture the consumers’ wallet share. Outpacing all realms of time, location and trends, hybrid packaging featuring both rigid and flexible components, yet being functionally superior, eco friendly and aesthetically delectable are all set to define the rules of the game in 2016. This adage holds as much ground as ever, when it comes to flexible packaging and the benefits, it brings to the value conscious consumers. People are looking to realize the value of each and every penny of their hard earned money spent in purchasing goods. Consumers want to experiment new products but not without trying them. Thus small packs and flexible sachets give that much-wanted convenience and freedom of choice to consumers at the most effective cost coordinates. Family size aseptic dairy packs are a big hit these days. Thanks to the ‘Flexibility’ quotient of packaging. Customized packaging is gaining ground with every passing minute. Brands and packaging converters are not leaving any stone unturned to reap economic and speed-to-market advantages in order to connect with consumers on a local, personal or emotional level. Flexible packaging over here offers that extra edge to play around with pack designs that make the customer feel on top of the world. There is a growing clamor for eco-friendly buying that cannot be quelled. It has been proved beyond reasonable doubt that flexible packaging production requires less materials and needs much less energy than other types of packaging. Being light in weight, it adds less weight to the packaged product and has a high product to package ratio. At the time of transportation, the light weight aspect plays a major role in cutting costs and reduction of carbon footprint, thereby being a comparatively sustainable option when compared to rigid packaging. Flexible packaging provides significant reduction in costs; raw materials used and transport costs besides offering several performance advantages over rigid packaging. Use of flexible packaging can significantly minimize package transport costs between the converter, packer/filler, retailer and end user. Not only do flexible packs take up less space when empty as compared to rigid containers, but can also be formed on the spot from roll materials at the filling location, thereby economizing transportation of ready-formed empty packaging. Post consumer waste can be re-processed further contributing to the circular economy. Thus flexible packaging is clearly a show stopper. Increasing Real Disposable Income: Real disposable income is one of the earliest leading indicators in any economy. The global northwardly trend in real disposable is a very positive sign for future packaging demand. Food Packaging: Examining from close quarters, real disposable income tends to lead food and beverage (F&B) spending by almost a year, which is one of the biggest revenue garners for the flexible packaging industry. The F&B spend is at an eight year high currently and with the rising disposable incomes it will only continue to increase. 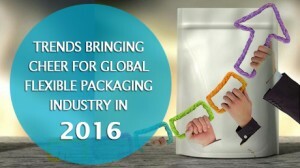 The long and short of it is that Food packaging seems poised for significant growth in 2016. The cheers are here to stay through 2016 – Take a look why? The economic conditions are by and large normalizing in most crisis-hit major economies. US economy is leaving the flat bed behind and ready to surge. The unemployment rates are down in the country. FED rates have been hiked for the first time since the global recession struck. The real disposable income is clearly showing signs of substantial upward movement. This is a great sign. The Eurozone is also beginning to see a light at the end of the tunnel. Surveys of bank officers in the Eurozone point that the worst of the financial crisis is now over. Eurozone purchasing manager indices for both manufacturing and services are all hinting that economy is not only growing but accelerating modestly. With the worst already behind Greece, the overall look is positive. The UK economy is not left behind either. The country’s manufacturing sector grew at its fastest pace in 16 months, and the rise in October 2015 ranking is being seen as the largest leap in the last years. Even in Japan, despite some remaining pockets of weakness, the manufacturing sector is growing from strength to strength. One can expect high consumer spending in 2016 which is a positive sign. The steady fall in the price of oil and other commodities will be a yet bigger positive as we get ahead into 2016, which is again a great plus.